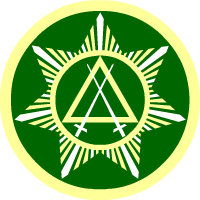 Well, today at the Northwest Regional York Rite Conference that is being held in Boise, I was approached by my friend Paul, who is an Idaho and Oregon York Rite Mason, and told me that I have been invited to join Clontarf Council #69, Order of Knight Masons out of Bremerton, Washington. I'm scheduled to go through the degrees in March of 2013. The reason I am going to Washington is that there are no Councils in Idaho. I am truly honored to be one of just a handful of Idaho Masons to be a member of this invitational body.